© Text: by Peter Lindop , Photos: Brian (Percy) Drummond. A record of our visit to First great Western's St Philips Marsh T&RS Depot in Bristol, organised by the late Richard Kingston. 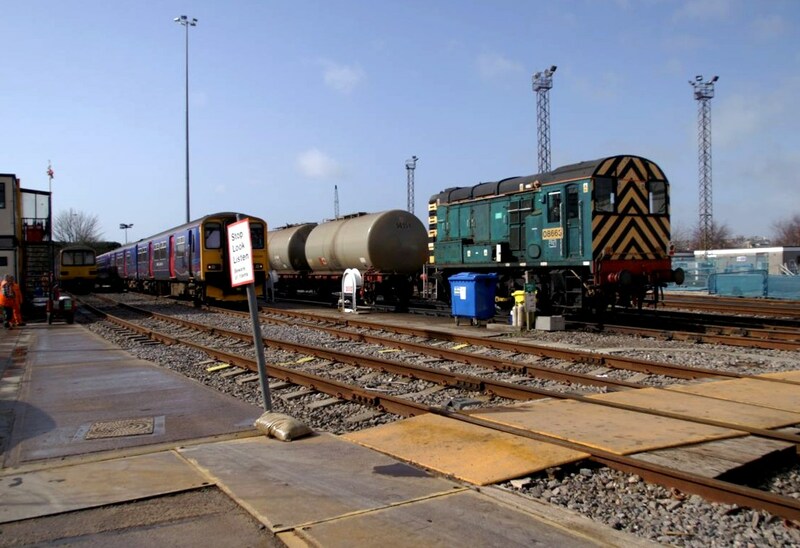 St Philips Marsh depot maintains part of First Great Western's High Speed train fleet as well as 15x series DMUs. Our thanks to First Great Western for making this visit possible. On a wet and wild morning, 9 members made their way to Bristol, most on the same train from London. We used a couple of taxis to get from Temple Meads Station out to the Clifton Suspension Bridge. The timing was right; it stopped raining while we were walking about, although it was a bit windy! Views were had along the gorge, with what appeared to be a high tide on the River Avon. 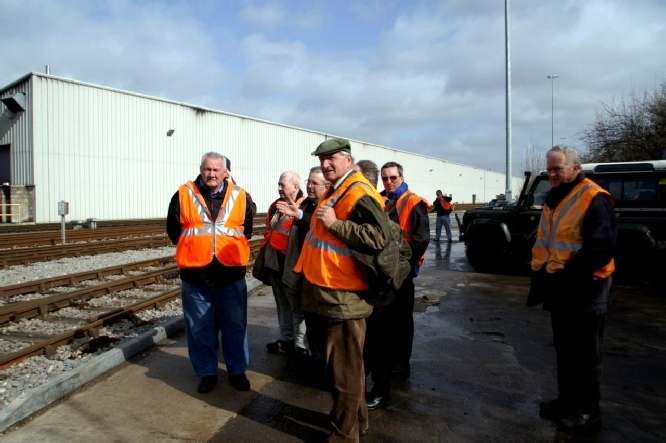 We then got back into our taxis and went to First Great Western St. Philips Marsh Depot (SPM), where we were met by Bob Pamment (Acting Depot Manager, Exeter). After signing in, we went to one of two old coaches, used as meeting rooms. Here we had the usual safety brief, and were given an overview of the site, its history, and current workings. 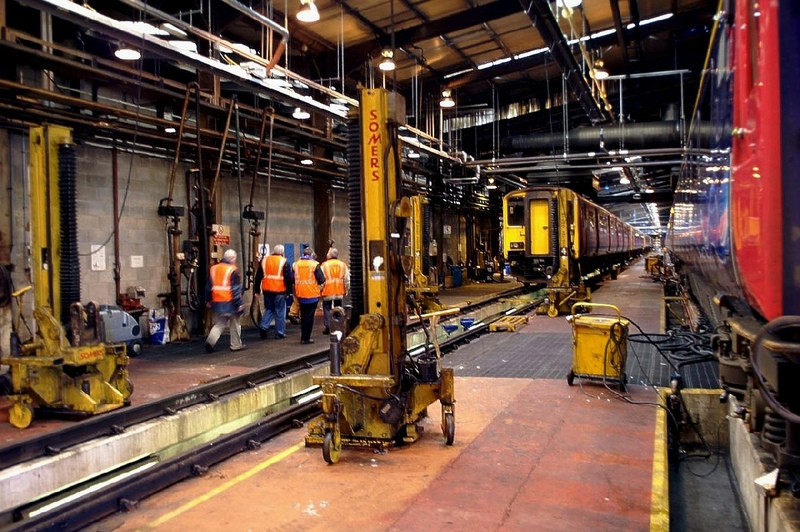 The present site has evolved from various sidings and sheds. The steam locomotive shed site is now the fruit market. The Marsh Junction building (2 roads) was used as the DMU shed, then became used for C&W plant. A 2-road extension on the side was used again for DMUs, normally as the paint shop or for window repairs. It has been extended to three-car length and is now back to servicing DMUs. 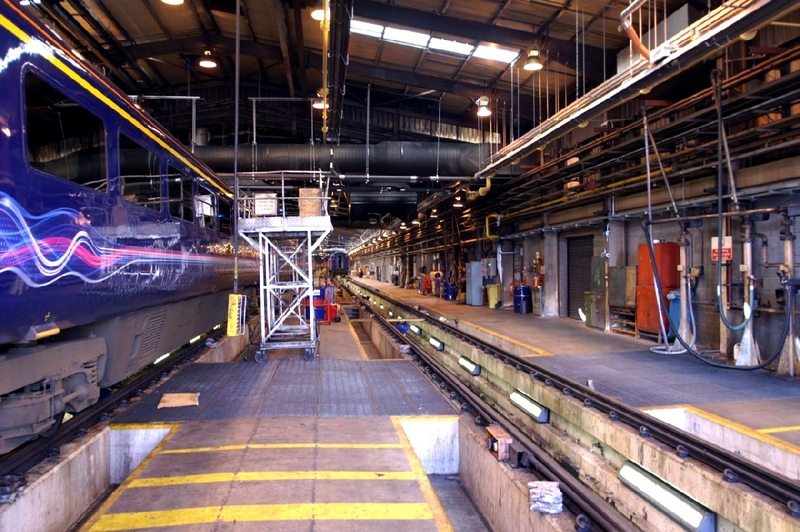 The SPM Main Shed is a 4-road building, built to service the High Speed Trains. At night there is a constant throughput of HSTs being serviced, during the day only repairs are carried out. HSTs normally leave the site at the east end, and DMUs the west end. The Lathe building houses a Hegenscheidt ground wheel lathe. This is only manned on the day shift. A remote controlled truck carries out movements. A 2-storey portacabin structure (known as the Wendy House) controls movements through the site. It is awkward in that a Network Rail line runs through the middle of the site. At last the new DMU shed is being built, the original builder having gone bust. This will be at the west end of the site. Following the explanation, we then headed out for a walk around the site. Although the sun was now brightly shining, the wind was very strong! We started westward, past the fuelling point and the signal box. The far west end of the site has the Victoria Sidings, used for HST cleaning. Alongside this, construction of the new DMU shed could be seen. The largest building on the site is the Main Shed, four roads wide, and long enough to easily take an HST. It also houses the main stores and offices, mess rooms etc. During the day, three of the roads are generally empty, perhaps some repair work being undertaken. It is at night when they become busy, servicing a procession of HSTs. The other road is used for DMUs. On our visit, mainly a collect of 150s, in assorted liveries. 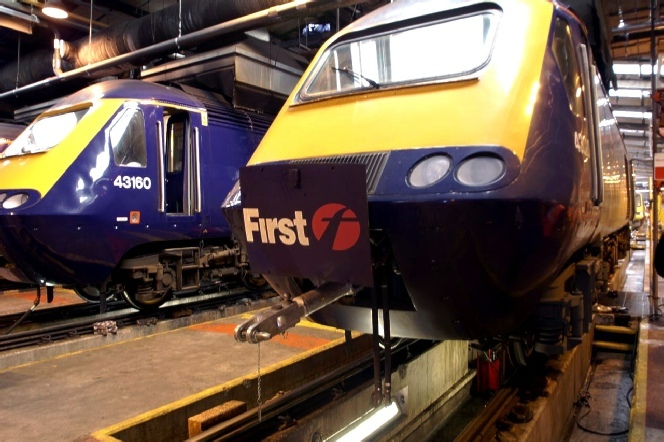 A Class 143 was also inside the shed, along with single HST power cars and 08s. Having walked the length of the shed, we exited and went across to the Marsh Junction shed. In here were some track plant machines, a Class 158 having an engine change, and a Class 143. The rails in here are raised, making maintenance on DMU's easier. A quick look in the Lathe shed, nothing turning today. It only operates on a day shift. Then it was back to the offices were we had signed in, for a buffet lunch! Rather than getting a taxi back to Temple Meads Station, we were offered a ride on an empty stock service, which we obviously took!! It turned out to be on 150 127, still mainly in Silverlink colours, and appropriate to some of the party who use to drive or work on it in London! Thanks to Bob Pamment and Mark Bell at SPM for a very enjoyable visit, and Richard Kingston for arranging the day. A class 150 DMU under maintenance. High Speed Train Mk3 coach to the immediate right. A view of the access pits for servicing under the vehicles. High Speed Train Mk3 coaches on left.